With an All-Digital Xbox, Microsoft ultimately achieves the same goal. All your games must be digital. That means either buying them directly from your Xbox or buying a digital code (instead of a disc) from a retailer. This is an Xbox One where you never have to swap discs. Of course, you can’t buy used games for it or sell your old games. That benefits Microsoft and game developers. Fewer used sales mean more money for game developers—no more GameStop hawking used games for almost the same price as new games and pocketing the profits for itself. An all-digital library could benefit you in interesting ways in the future, too. 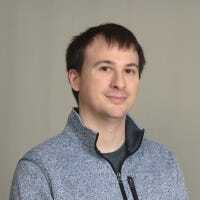 Microsoft was experimenting with running Xbox One games on Windows 10 PCs during the May 2019 Update‘s development process. If you have a library of digital games, you could one day end up playing those games on your PC—just like with Steam. 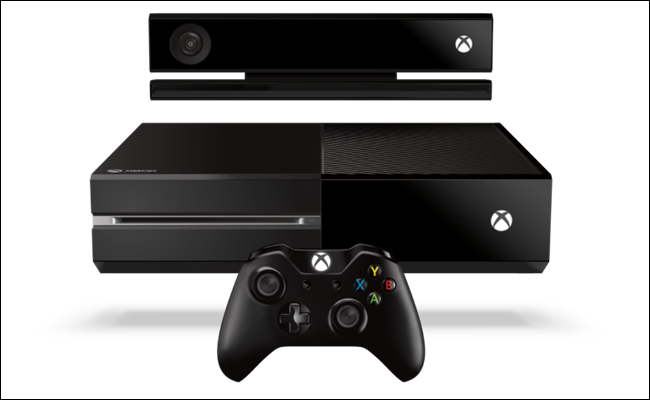 Or a future game-streaming service could stream your licensed Xbox One games to any device. 2013 wasn’t that long ago, but it can be hard to remember what the gaming climate was like back then. The PS3 and Xbox 360 were feeling long in the tooth, and with E3 coming everyone was looking forward to exciting details about incredible new hardware (some things never change). That generation of console wars had both surprises and stumbles. The Wii shocked everyone with a family-friendly console incapable of high-end graphics that sold incredibly well. The Xbox 360 also sold well thanks to exclusives like Halo and Gears of War, a robust online gaming service, and the last minute surprise hit with the Kinect. Sony, however, practically surrendered the first place spot with a disastrous launch of the PlayStation 3. The system was originally $600 (the Wii was $250), and Sony constantly gave off an arrogant vibe when marketing the new machine that lead to gamers turning the company into something of meme-attracting punching bag. If any of that sounds familiar, that’s because you remember what happened next. Microsoft preceded to announce the most expensive console of the new generation. That originally announced Xbox One was packed with features and requirements gamers didn’t want or understand. 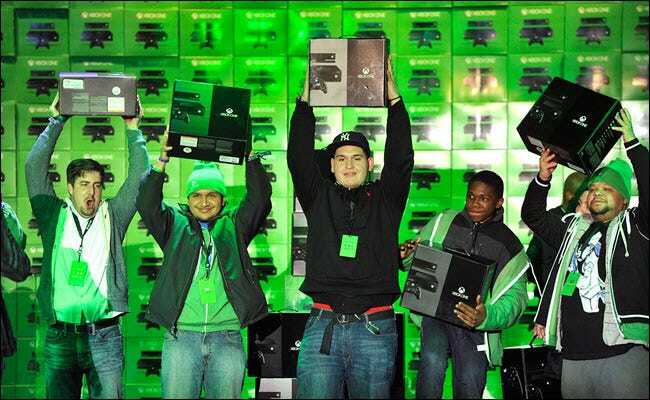 When Microsoft announced the Xbox One it was the most expensive and physically largest console of the new generation. It came bundled with a mandatory Kinect, had a significant emphasis on TV and media capabilities, and required an internet check every 24 hours. Gamers revolted. They didn’t want the Kinect, they didn’t care about TV capabilities, and in 2013 an always-connected console was too large an ask. Because every Xbox One owner has a broadband connection, developers can create massive, persistent worlds that evolve even when you’re not playing. As gamers pointed out, high-speed access wasn’t as common in 2013. It’s still not pervasive throughout the USA today. When confronted with that fact, a Microsoft Executive famously quipped that those users should stick with the Xbox 360. It took too long, but Microsoft finally started listening to their audience. History has proven gamers mostly correct: The Kinect for Xbox is dead, and the console’s TV and media capabilities are a shadow of their original promise. The Xbox One S both shrunk the size of the console and eliminated the original console’s giant power brick. As was often the case, Microsoft may have been too far ahead of itself. These days digital purchases are more tempting than ever, especially as games balloon well beyond disc storage capabilities and high-speed internet grows ever more prevalent. Many of the most popular games of recent years, from Fortnite and Apex Legends to DOTA 2 and Counter-Strike, are all about online play. Physical games are still convenient because you can often buy them for cheaper than a digital download—and resell them later. But we’ve seen digital downloads take over the PC space. In the meantime, Microsoft has done everything it can to win back gamers. The Xbox One now has backward compatibility, the Kinect is gone, the Xbox One X is the most powerful gaming console (at least for a little while longer), and Microsoft led the way in its calls for cross-platform play on games like Rocket League and Fortnite. Digital is good for Microsoft’s business, too. It won’t have to share a cut of the revenue with retail stores like GameStop. Whether you buy digital copies of games through the Xbox store, subscribe to Game Pass, or subscribe to game streaming (if Microsoft enters that arena, which seems likely), your dollars go to Microsoft—and the developer, but not a middleman store. While Microsoft hopes that all hard work will cause gamers to embrace the All-Digital Xbox, unfortunately, the price is all wrong—at least right now. A screenshot from Microsoft’s official Xbox website. Why would you buy the Xbox on the right? 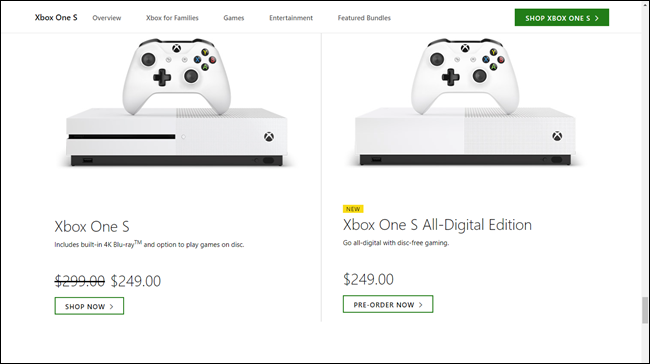 Microsoft’s announcement places the suggested retail price of the All-Digital Edition at $250. The company clarified to Ars Technica that it’s meant to be $50 cheaper than the standard Xbox One S. But that’s not currently true. While the MSRP of the Xbox One S is $299, take a quick look around, and you’ll quickly find it for $250—often with a game or other extras. That leaves the two consoles effectively priced the same. And, while the All-Digital Edition does come with three games, two of them (Minecraft and Sea of Thieves) come with Game Pass. The third, Forza Horizon 3, doesn’t—but its sequel, Forza Horizon 4, does. And, if you’re going all in on All-Digital, it seems likely you’ll want to grab Game Pass—after all, Microsoft will offer you three months for a total of just $1. Retailers like Amazon and Best Buy are already selling the Xbox One S All-Digital Edition for $250. But, even if they were selling it for $200, that still sounds like a hard sell. You’re not only giving up the ability to play physical games—you’re also giving up a 4K Blu-ray player. 4K Blu-ray players are expensive, ranging in price between $100 and $300. If you’re going to buy an item anyway, spending $50 more to have a 4K Blu-ray player thrown in seems like a steal. That puts Microsoft between a rock and a hard place. Realistically speaking, the tantalizing price for an All-Digital Xbox is $200 or less. No matter what the price is, it needs to be more than $50 apart from the current Xbox One S.
But, priced at $150, this new Xbox could be a compelling option. Ultimately, it’s heartening to see Microsoft has learned the hardest lesson of all: Giving gamers a choice to decide what they want.